Goa: The ambitious Ayushman Bharat – the National Health Protection Scheme – under the aegis of the Prime Minister Jan Arogya Yogana (PM-JAY) has been at the center of conversations in healthcare circles since its launch some months ago. 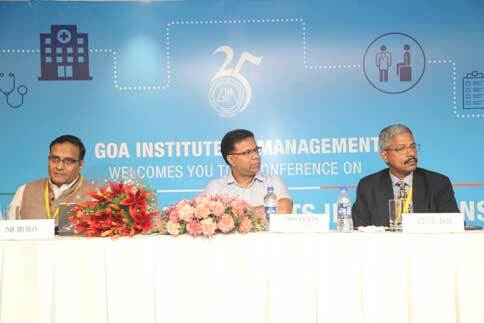 Goa Institute of Management (GIM) organized a debate where thought leaders representing Government, Industry and Academia discussed and deliberated on the nuances of the Ayushman Bharat programme. “The ambitious program aims to offer access to affordable healthcare to the people who need it the most while also offering financial protection from high expenses on healthcare. The programme will also generate employment and create healthcare infrastructure including hospitals in tier 2 and tier 3 cities” he explained further. Speakers and Panelists include Indu Bhushan, CEO, Ayushman Bharat; Sujatha Rao, Former Union Health Secretary; Ashutosh Raghuvanshi, CEO, Narayana Health; Joy Chakraborty, COO, P.D. Hinduja Hospital; A. Vaidheesh, V.P. South Asia and M.D., GSK; Ashish Kohli, V.P., One Ethicon Surgical Businesses, J&J Medical India; Punit Kohli, M.D., Fresenius Medical Care India Pvt. Ltd and Sakthivel Selveraj, Senior Health Economist, PHFI. One of the key announcements in the national budget, 2018 of the Government of India was the launch of Ayushman Bharat – the National Health Protection Scheme, through which government aims to provide health coverage to over 500 million people, many of who are unable to afford secondary and tertiary care services. The scheme which lays out a grand plan for the population has caught the attention of the general public, industry and healthcare professionals and thought leaders. The conference is one of the several initiatives undertaken by GIM to celebrate its completion of 25 years of imparting knowledge to the country’s future corporate leaders.